PhoenixMotorsport's engineering workshop is located near Heathrow Airport in London. 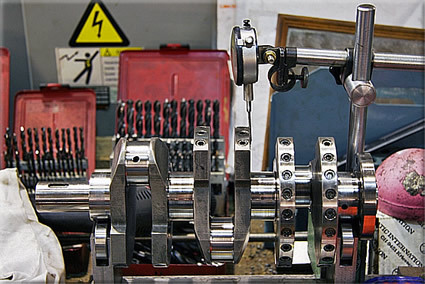 Our Computer Numerical Control (CNC) machine facilities, which include milling, turning and grinding, are just part of the custom manufacturing processes we carry out at our site. Because of the close collaboration between our Engineering facility and our Engine Component and Preparation department, there is little that is beyond our scope. Our machining facility is in constant demand, from producing our performance brake discs/rotors, to the manufacture of a stroker crankshaft from a solid bar billet of EN24 steel, as can be seen in the image on the right. A new lightweight aluminium flywheel can be made to give you the edge over the opposition where an alloy flywheel is not generally known to be available. One-off bespoke component manufacture is available with machinists who love and understand motorsport, so we can often guide you from an idea to a product when you are unfamiliar with the machining processes, and your product privacy will be honoured.